This is the perfect bedspread. You can use it in the warmer weather when you don't need a heavy cover or you can also use it in the cooler weather. Quality is excellent and it washes nicely. Add style and comfort to your bedroom with the Ashton 100-percent Cotton Chenille Super Soft and Plush Bedspread. This bedspread features an eye-catching medallion pattern with a solid reverse and button bell corners. The bedspread arrived yesterday. I ordered the ivory in the king size. The ivory was darker than I expected, but it would work. I washed it in cold water and then put it into the dryer. Every 20 minutes or so, I cleaned the lint screen as I knew it would shed. I removed it from the dryer while it was slightly damp and then folded it in half and let it air dry. Today, I put it on the bed and it is gorgeous. It is very generous and covers the bed and boxspring which measures 23 inches, plus another 10 inches of leg. I understand the cotton chenille will continue to shed somewhat, but I also understand, it won't be forever. This chenille bedspread is the best I have seen for years. And it makes my king sized sleigh bed beautiful. By the way, washing it in cold water and drying it on medium and taking it out early, it did not shrink one bit. Purchased this for a client in Ivory... full size and she LOVES it! The medallion pattern is gorgeous. A little advice... wash spread by itself, chenille does tend to shed. Use a cap full White Vinegar in wash to maintain colors. Compare dimensions to mattress and ensure a proper fit. 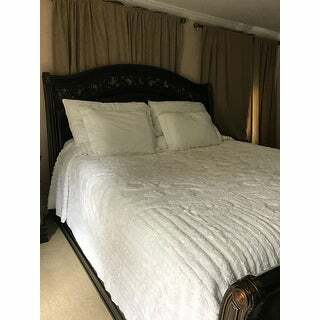 (Some bedspreads are larger) Highly Recommend! I love this bedspread, so nice! It looks nice, full and plush. My only suggestion is that you order up if you like bedspreads to meet the floor. I have a king bed and could do that. I need at least another foot on each side, I knew this ahead of ordering since I always have this problem. I am now looking for a pretty bedskirt. 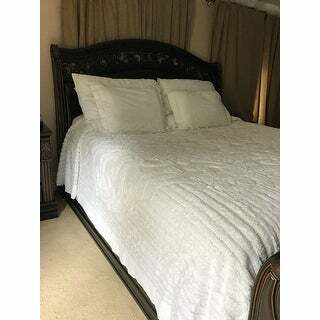 I still rate this a five stare review as it is much nicer than most chenille bedspreads out there, especially for this money. It's really lovely on the bed. Very soft and plush... and the color is perfect... matched what I saw on the screen great. Love the look and feel of this quilt but the shedding is awful! I had it in the dryer for probably about five hours constantly cleaning the lint trap. And it still gets lint balls everywhere. I washed my sheets and had to do it twice just to get the lint off. Its getting a little better but not much. Had it for probably a month now. Love this bed spread, long/wide enough that I don't need a bed skirt....Wonderful! This is a great bedspread! I got the pink color, And the picture that's displayed by the description is accurate. I purchased the king-size and it's a very generous fit. I really like this bedspread, I bought the blue and it is not as dark as what I thought it would be but it is a light blue but still goes with my bedroom colors. I will say the chenille is not all over the top there is some spacing between the design, more than I expected where it is just cotton material and no chenille. It is fairly warm, my husband loves it I find it can get a little too hot for me but I just toss it over away from me and I'm fine. In really cold weather with a lighter blanket under it will probably be enough to keep most people comfortable. I have really tall king mattresses and this hangs way over on each side. I would buy again. I was trying to find a chenille bedspread like my grandmother had; soft, plush and heavy. This is it! I bought the Ivory color in queen size and placed on a full size bed. It fits perfect, almost to the floor all around. One word of warning: at first it will shed like crazy, but I think this is a characteristic of true chenille. I probably washed it at least 7-8 times before it completely stopped shedding and fluffed out. I've had it a couple years now and it is still just beautiful. This bedspread is very pretty, launders great and I am enjoying it very much. Gives lots of light to the bedroom. I like the weight of the bedspread and it reminds me of sleeping at my grandmothers house when I was young. I have washed the spread a couple of times and am still waiting for it to stop shedding chenille 'fluff' and lint. This chenille bedspread is pretty and heavy. I wasn't disappointed whatsoever. I washed it before putting it on my bed . . . there was no shedding at all, not in the washer or dryer, not on my bed. My only warning is that it may be too warm for Florida winters. I only left it on bed for one month this winter. LOVE it! Planning to buy another one for a Mother's Day gift. I love the quality of this bedspread. I used a Standard Twin on the Twin XL and it fits. They washed up beautifully. First couple of washes you will have lint, but eventually that lessens. I just love my beautiful oversized bedspread on my tall antique bed, that had been converted into a queen . It makes such a statement in our large bedroom and works well with my other accessories and some other wonderful antiques I used with it ! There is such a clean flow to it as it drapes to the floor. I could not ask for a more beautiful bedspread for my decoration needs. I have washed it and it came out beautifully. I would most certainly recommend this addition for anyone's bedroom. Nothing but cotton for me, I Love It ! "I can't find the pillow shams on the site for the Ashton 100-percent Cotton Chenille Super Soft and Plush Bedspread"
"where are the pillow shams"
"Where are the shams to purchase for this bedspread?" "Is the pink more towards purple, dark rose? Erin D"
"I need two sets of pillow shams to match my IVORY BEDSPREAD Please send me info"
"I need the shams to match my spread,Ashton king ivory,I thought they came with it,I need king shams color ivory When will they be available"
O king shams only standard size but not sure t h ey have them in stock. "Are the shams available in the sage green? What is the cost?" The shams are available in standard size sage green under the options tab. Please add them to your cart to see the price.